Elisabeth Meyer creates small, delicate prints that are influenced by natural and architectural environments. She also creates work on larger, shaped plywood that uses both painting and printmaking techniques. 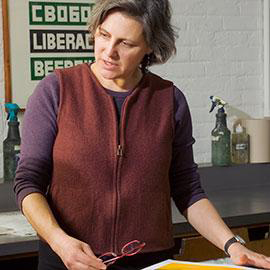 Meyer has been a visiting critic at Brown University and the Rhode Island School of Design and has exhibited her work throughout the United States and in Italy. She received her B.F.A. from the University of California-Berkeley and M.F.A. from the University of Texas-Austin. She lives in Trumansburg, NY.